I attended the Watercare Board meeting today where the preferred site for the new Water Treatment Plant was going to be decided. The event was very sombre. Groups from both the Waima and Oratia communities were present. It was akin to turning up to a funeral and not knowing which person was going to die. And the decision has been made. Watercare has decided that a new plant on the Manuka Road site is its preferred option. The Oratia sites have been excluded. I am very pleased for the people of Oratia that the threat of the loss of their homes and devastation of their neighbourhood will now not occur. They have run a really effective, noisy and passionate campaign. It is great to see people power working. I am worried however at the threat that is now being posed to the Waima area. Watercare needs to consult fully with locals on the proposal and any environmental damage and disruption must be minimised. 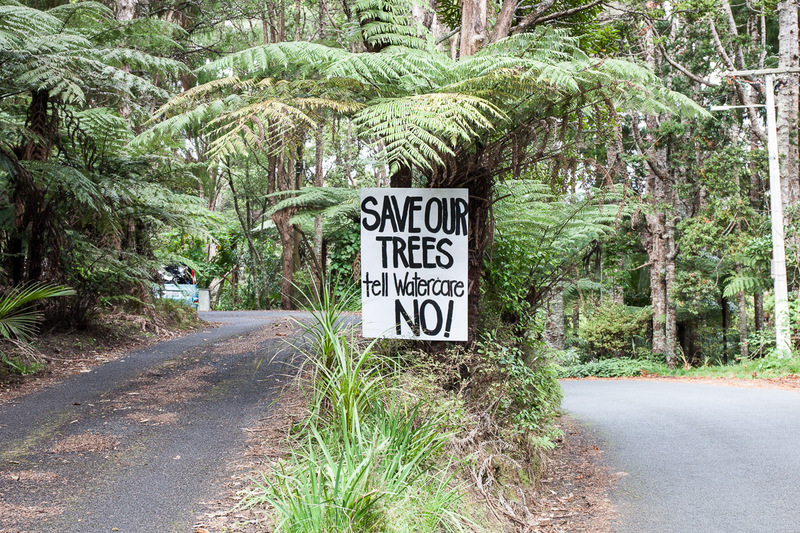 Watercare owes it to the people of Waitakere to conduct itself in such a way that the aims and objectives of the Waitakere Ranges Heritage Area are adhered to and that damage to the environment and local disruption are minimised as much as possible. The presentation before the decision was brief but highlighted the thinking that has occurred since the announcement of the short list. It was identified that the Significant Ecological Area overlay placed on the Manuka Road site by the Unitary Plan meant that a resource consent would be required for vegetation clearance. This triggered an obligation to consider alternatives and this is why the options were considered. The legal advice was that under section 36 of the the Resource Management Act there was no obligation to consult. While technically correct this statement ignores the fact that Watercare is a Council controlled Organisation and as such has a duty to “exhibit a sense of social and environmental responsibility by having regard to the interests of the community in which it operates and by endeavouring to accommodate or encourage these when able to do so”. The presentation pointed out that costs of both leading proposals were very similar, within 1% of each other but that the costs of a third option, to reuse the existing site, would cost $141 million more to retrofit the existing site because of the need to shut the site down and advance work associated with the increase of supply of water from the Waikato River. The officer analysis was that both sites were similar but that building on the Parker Road North site adverse effect on community cohesion and way of life, while building on Manuka Road would have an adverse environmental effect. This is where the effect of Oratia’s campaign was probably decisive. Their campaign of highlighting the human effects of building in Oratia clearly altered Watercare’s thinking. The recommendation from Watercare’s officers was that the Manuka Road site be selected as Watercare’s preferred site with reservoirs constructed on Woodlands Park Road. This recommendation was accepted by the Board but with three important riders. The first was to add the phrase “avoiding wherever possible significant trees and adverse environmental effects” to the resolution. The second was to confirm that the application will be made to Auckland Council for resource consent, presumably on a notified basis. The third was that a community liaison group or similar was to be set up. I have been impressed by the response of the Woodlands Park residents who have recently organised themselves and are mounting a campaign which will test Watercare’s decision every step of the way. The issue is still far away from being resolved. The battle for Oratia is now over. But I am sure that the battle of Manuka Road is just starting. Thank you for your work and comments Greg. Watercare marked out areas both sides of Woodlands Park Rd two-three years ago. Evidence suggests Watercares motives and strategic positioning existed over this issue some time back. Setting up a Watercare Community Liaison group smacks of appeasement. I don’t believe people either side of Scenic Drive wanted others losing homes over this issue, however, Watercare playing off +/-12 homes in Parker Rd v’s vegetation in Woodlands Park was an emotive argument set up, I suspect, by Watercare. An argument weighted in favour of todays decision. Thanks Owen. It is a tough issue and we may be back where we were always going to be. I am sure Waima can mount an impressive opposition to Watercare’s proposal.